Some of the guys in the video were on target with their answers, others were a bit off. Below, we’ve pulled some quotes, not from just any guy on the street, but from some men who have been intentional about their leadership. “If you look in Ephesians, Chapter 5, and you look at the list of qualifications, really, for a husband — you look at this picture of what it means to be a Christ-like leader — basically, to lead a wife as Christ leads the church. You find that the picture is not just about a guy who pounds his chest and says, ‘Me man; you woman — me speak; you do.’ He’s to lead in love. He’s to lead in the Word. He’s to lead in righteousness. He’s to lead in selflessness, and he is to lead in intimacy. “Two words — serve and lead — may seem like a contradiction, but they are inseparable according to Scripture. While the Apostle Paul tells us in Ephesians 5:23 that ‘the husband is the head of the wife,’ he quickly puts to rest any notions that this leadership allows any form of selfish male dominance. He completes the sentence with ‘as Christ also is the head of the church.’ Then the passage goes on to say that husbands should love their wives ‘just as Christ also loved the church and gave Himself up for her’ (verse 25). Four weeks ago, we were in great anticipation of the Super Saturday Stepping Up event that was about to explode across the nation with more than 23,000 men attending more than 1,000 events from Alaska to Florida and New Hampshire to Hawaii. Though the fervor has died down, the stories that came out of that great event are uncovered almost daily. This past week, FamilyLife sent out their newsletter, The Family Room with an article about what happened on Super Saturday. We thought it would be good to share some of the stories that we’ve captured at the one month mark after the event and hope you are continuing to be encouraged by what God did in so many men’s lives that day. We know there are more events happening. 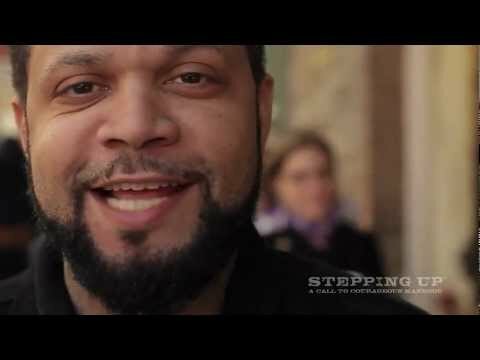 If you have an event and want to draw attention to it, don’t hesitate to share your Stepping Up event on our Facebook Page – MenSteppingUp and we’ll post it so that as many men as we can reach know about it. Additionally, if you are starting a follow up study (like our Stepping Up 10 week video study), share that as well. Events are great. They are catalytic and can energize a community, church, or neighborhood. But, eventually, the energy from the event fades and the only way any movement can be sustained is by leaders stepping up and making it happen. Tell us those stories as well on our Facebook Page or in the comments below. Celebration is best done together! Enjoy the stories of what happened on February 2, 2013 and what God did and continues to do in homes, churches, and communities around the country. History was made on Super Bowl Sunday, February 3, 2013, when a record 164.1 million fans tuned into CBS and watched the Baltimore Ravens beat the San Francisco 49ers, 34-31. But the Ravens weren’t the only champions that weekend. The day before, on Super Saturday, an estimated 23,000 men gathered together for FamilyLife’s one-day Stepping Up Video Event. These men were not yearning for the Vince Lombardi Trophy. Instead, they want to be champions at home. They met in churches, houses, offices, and on college campuses. They were at retreat centers, restaurants, prisons, and military bases. They met in all 50 states and around the world: in Budapest, Hungary … Mexico City … the Cayman Islands. Regardless of where the men gathered on February 2, or the size of their group, they all were taught how to step up courageously to be God’s man. They watched DVDs featuring ministry leaders like Dennis Rainey, Robert Lewis, Matt Chandler, Mark Driscoll, Voddie Baucham, and others. Dennis Rainey, the president of FamilyLife, decided to show up unannounced at the Super Saturday gathering at FamilyLife in Little Rock, Arkansas. He went because it was organized by a 16-year-old young man named Westley and two of his buddies. More than 50 men were in attendance there. “I wouldn’t have missed how three young men made an impact on their peers and men of all ages,” Rainey says. Pastor Frank Johnson of Lake Ridge Baptist Church (Lake Ridge, Virginia) teamed up with WACMM’s conference director, Tony Dronkers, to host a Super Saturday Stepping Up event. WACMM is focused on helping not only pastors, but also the leaders of their men’s ministry. Dronkers says that Super Saturday was a great fit. Pastor Johnson wanted to jump start his ministry to his men, and WACMM was able to bring some other churches together to share the opportunity. So on February 2, more than 60 men watched the Stepping Up videos at Lake Ridge Baptist Church. Twenty-three were from the host church; the rest were from the community and other small churches in the area. One man drove about 100 miles with his son to attend. “I loved the conference and the impact it had in reminding us who we are called to be as men of God,” he said. Pastor Kyle Bond had been praying that God would direct him to a simple curriculum that could be used as a catalyst to get men motivated to being the men that God has called them to be. He believes that Stepping Up was an answer to his prayer.